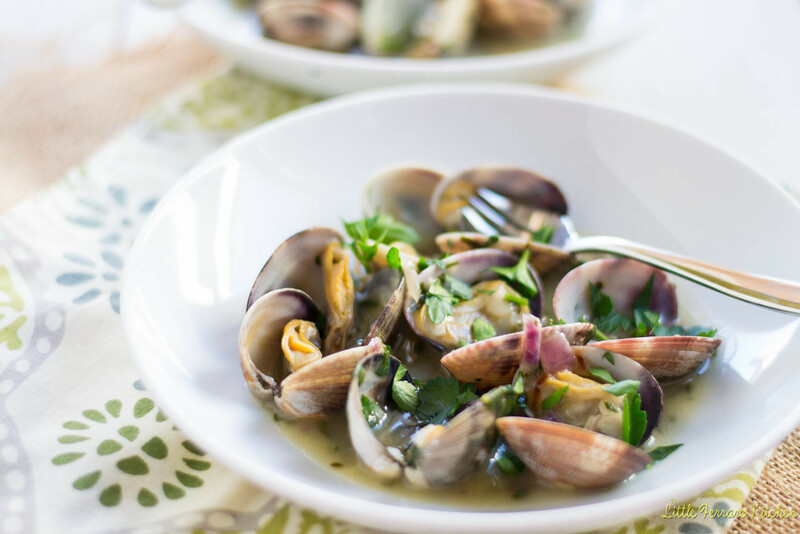 Finally after nearly a month after our extravagant trip to Spain, I am now sharing one of my favorite…absolutely favorite tapas..clams in green sauce or as they call it “Almejas en Salsa Verde”. I was nearly jumping up and down for joy when I saw that this weeks #SundaySupper theme was Tapas. We certainly ate our way through Barcelona and San Sebastian in tapas and “pintxos” as they call it in San Sebastian. One of our favorite spots was right off the main strip in Barcelona. Called “Cañete“, a small restaurant with amazing Yelp reviews. Even the locals at the hotel were in awe and made sure we told them how this amazing place. According to Yelp, everyone said the same thing, sit at the counter and learn your Spanish. The entire menu was in Catalan which was the main key in knowing this place was for the locals. As we arrived to this narrow door and off the strip, I say in my not-so perfect Spanish “Dos personas, Ferraro” hoping that would make some sense to them and not make us feel like dumb American tourists. The next thing I know, the waiter in his starched white jacket, flees us to the only 2 open seats at the counter. And this was our view. Overlooking the fabulous cooks doing what they do best. We were nearly a feet away from the main stove and you certainly felt like you were in a hot kitchen. There were about 10 staff, some waiters, some cooks and 1 expediter which I am assuming was head chef. The kitchen was spotless and everyone ran smoothly They all had a job and they all worked together like a perfectly tuned orchestra. We watched them freshly crack our clams and rub a sweet tomato against freshly grilled bread. It was not just the dinner, it was the entertainment. Watching and listening to the orders being called out and picking at what words I remembered from high school Spanish class. The entire night was amazing. If this is how the Spaniards eat and respect their food, I could live on their cuisine. And boy am I glad that I took these quick shots of our dinner. The above is what I attempted to replicate for this recipe. One of the beautiful things I learned about Spanish cuisine is that there is not a lot of butter, if any in most of their dishes. Spain has some of the best olive oil I have ever tasted and they know it. It is not too overpowering and still gives the dish enough fat and coating to hold on to. With this recipe, I knew there had to be some kind of thickening agent but I was sure there was not any butter in the dish we had at Cañete. So to the olive oil, I added just a tablespoon of flour which worked perfectly. The flour fused with the olive oil and made a simple paste. Then when I added wine and liquid, the entire sauce thickened beautifully and coated the back of my spoon just like it was supposed to. They call it “green sauce” because..well it’s green, which comes from the fresh parsley added in. I hope my rendition of this simple clams and green sauce proves my new found love of Spanish cuisine. Simple and fresh ingredients is what it’s all about! First clean your clams. Allow them to soak in a bowl of cold water for 20 minutes. Then take each clam and use a soft brush or wet towel to clean the outside shell. A good tip is to not pour out the clams and water, instead remove them one by one. You can then allow to to sit in another bowl while you prepare the rest of the dish. In a large skillet, drizzle olive oil and add chopped onion. Allow onion to cook for about 5 minutes until it begins to caramelize. Then add garlic and red pepper flakes and continue to cook for another 3 minutes until the garlic begins to caramelize. .
Add flour and use a spoon to cook the flour into the olive oil. It should form a paste. Next add white wine and a cup of water and salt and pepper and increase heat. Continue to stir so all the flour is cooked off and sauce begins to thicken. Add chopped parsley and clams and lower flame so sauce is simmering. Allow clams to cook until they begin to open and remove clams as they open. When all clams are removed, you can either continue cooking the sauce to reduce more. It should lightly coat the back of a spoon. When done, place clams in a bowl and pour sauce over. Garnish with extra parsley. This recipe is enough for 4 tapas, which is about 6 clams per person. You can adjust the amount of clams per person as needed. Please check out what everyone else made for our Tapas party! I am so jealous of your trip to Spain! I need these clams in my life immediately! Thanks Isabel!! It was am amazizng trip!! What a beautiful recipe. That must have been an amazing experience! It really was Connie…thanks!! Thank you for hosting this week too! Yum! What great flavors to accompany clams! It looks just amazing!!! Thanks Helene!! I love simple too! Clams are one of the only seafood I eat. This sauce with the clams sound awesome. I’ve become so spoiled by fresh food that I don’t think I’ll ever be able to go back. 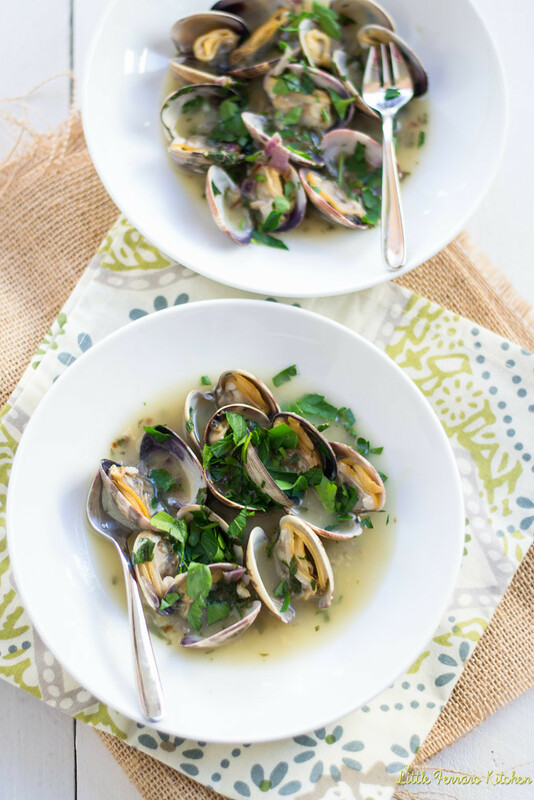 I love this recipe and can’t wait to uncover some clams at our next ocean visit to make this myself. Oooh, I forgot how much I love clams! Oh my. These look amazing!! I think I’ll have to try these SOON! Spain is on my bucket list and when I do visit I want to do just as you did and visit the local favorites! What a beautiful dish! 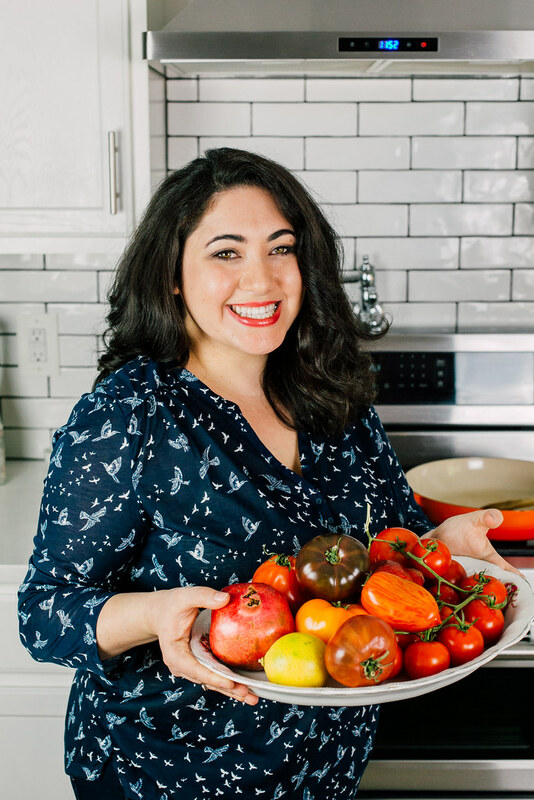 I adore this recipe Samantha! It looks amazing! I must try this! Now I really really want to go to Spain!!! Nice to hear they don’t use a lot of butter over there so I can eat all I want and still feel healthy! 🙂 You did a great job replicating the clam dish! Spain is on our list for our Honeymoon and this post makes it at the top of the agenda! Love this recipe. Megan @ I Run For Wine recently posted..Chorizo Filled Dates Wrapped in Bacon for #SundaySupper Tapas Party! Your trip is amazing! These clams are simply gorgeous. I can picture myself savoring this amazing dish while in Spain! Wonderful!!! I felt like I was with you at the restaurant. And now I can even make the same dish! YUUUUMMMMM! Amazing tapa! I often find the most simple recipes to be the most scrumptious! 🙂 You made me miss Spain… terribly! sigh! I love clams served this way! Yours look so inviting, Samantha! Oh my, love everything about this! Spain is our next trip after Italy and I can’t wait to eat my wait in tapas, cheese and spanish ham! It is always fun to recreate a dish from your travels. 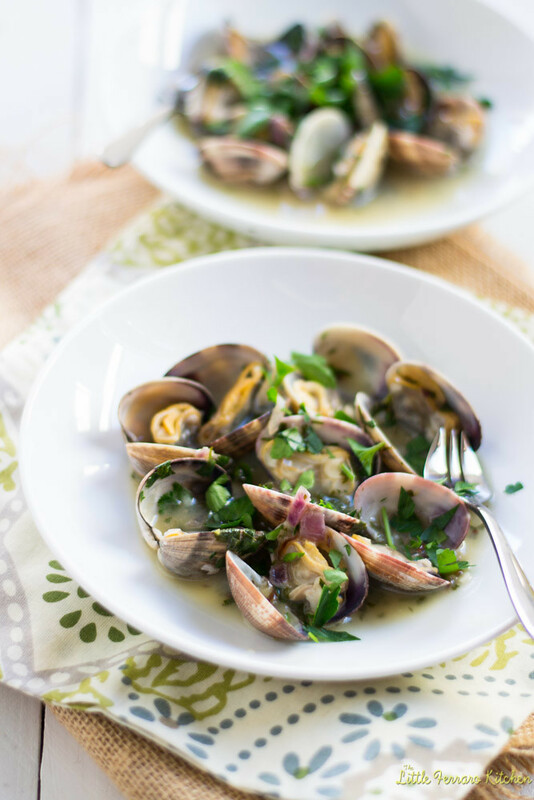 Your recipe sounds terrific, flavorful but still lets the fresh clams taste shine through. Such a beautiful dish and a lovely recipe too 🙂 Love Clams and totally going to try your recipe! Thanks Soni!! Let me know when you try it! !